As unfortunate as it may sound, a winner did emerge Monday after UFC bantamweight contenders Dominick Cruz and Raphael Assuncao announced they had come down with injuries within minutes of each other. With Cruz (#2 ranked bantamweight) and Assuncao (#4) riding the pine for the foreseeable future, Renan Barao (pictured) is now the UFC’s best option as champion TJ Dillashaw’s next opponent. Actually, he was their first option before single-handedly ruining UFC 177 by missing weight and getting pulled from his rematch with Dillashaw just 24 hours before showtime. That’s why there might be some apprehension on the UFC’s part to reward the #1 contender with a title tilt just one bout removed (Barao blasted Mitch Gagnon on Saturday) from August’s debacle. 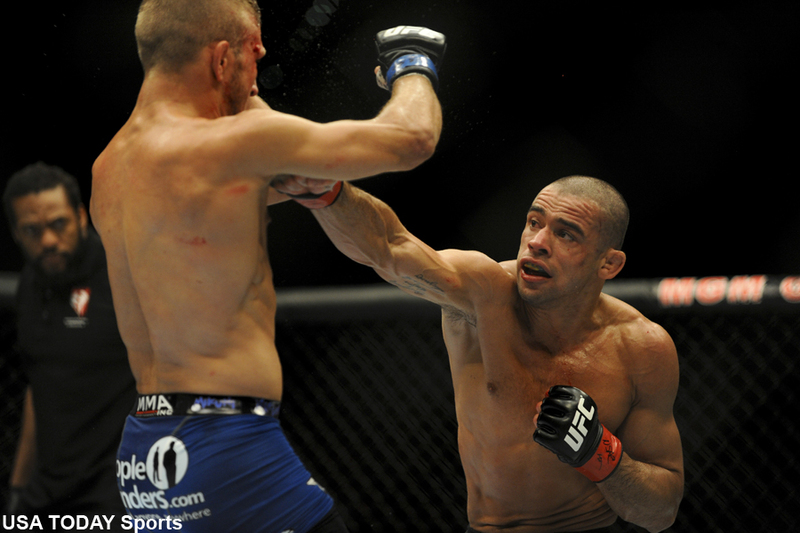 However, Barao will now likely be bumped up out of necessity. Who knows how long Cruz will be mending his ACL injury and the UFC won’t allow Dillashaw to sit the sidelines for two more months as Assuncao’s broken ankle heals. There is the teammate vs. teammate angle the UFC could sell with Urijah Faber (#3) challenging his Team Alpha Male protégé, but the two have already said the money would have to be right (REALLY right) in order for that to happen. Given that Faber has posted a goose egg in his last six championship affairs and Dillashaw has only defended his throne once so far, it wouldn’t make sense financially for the UFC to pay them more than necessary for fans to see that scrap this early in Dillashaw’s reign. And that leaves Barao. It’s not as though he’s unworthy. Prior to getting upset for his belt by Dillashaw, UFC president Dana White was aggressively forcing the Brazilian down fans’ throats as the game’s best pound-for-pound fighter. One bad night shouldn’t erase his entire résumé. So, who’s the big winner? Barao’s the big winner! It was like he won yesterday despite being on a bye week.